Another track, Shall Not Care has a strange Eastern sound. The follow-up Balaklava, was in similar vein, and based around the concept of the charge of the Life Brigade at Balaklava in 1852. It also includes a beautiful version of the Leonard Cohen song Suzanne. All the other compositions are Rapp's, including the final track Ring Thing, which is possibly the strangest of all - taken as it is from the cornerstone verse of J.R.R. Tolkien's Lord Of The Rings. Rapp abandoned his use of abstract themes for his remaining albums which were more conventional. He also signed for the better known Reprise label. 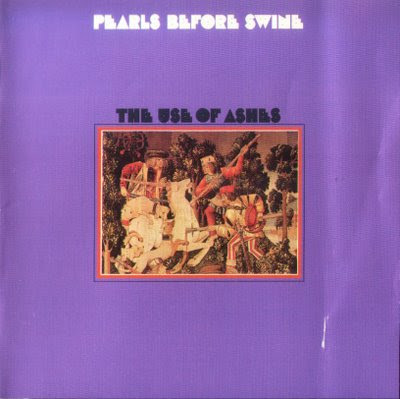 Although possibly less interesting than those first two albums, the remaining four Pearls Before Swine LPs are still well worth hearing. The Use Of Ashes album and part of the follow-up, City Of Gold were recorded in Nashville. The remainder and Beautiful Lies You Could Live ln were made in New York. In 1972, Tom Rapp started recording under his own name, although his first solo album was largely comprised of re-recordings of songs from his earlier albums. Fans of the band and Tom Rapp will also be interested in a tribute album For The Dead In Space, including Fit And Limo, Bevis Frond, Mourning Cloak and even an exlusive track by Tom Rapp himself. More recently Tom Rapp has performed at Ptolemaic Terrascope's 'Terrastock III' and released a fine solo album, A Journal Of The Plague Year. Roger Crissinger was later in One.